If you have children you may feel that you want a lawn, however small, for them to play on. This is fine as long as you are prepared to keep it cut and have somewhere to store a mower: a small hand mower is probably all that is needed. If you are going to have a lawn make sure that it is a good one. The area should be completely flat and can either be laid with good quality turf or sown with a fairly tough seed mixture. It there really is not enough space for a lawn you could have a sandpit for the children so they have something soft to play on. When choosing plants go for tough shrubs, but not prickly or poisonous ones, and avoid delicate plants that can easily be snapped off. Children will need space to play in the garden so it should not be overcrowded with plants. Children usually have bikes or toy cars on which they want to race around the garden, so any paving slabs or bricks should be completely flat to avoid hazardous bumps. Water features should be avoided as even a few inches of water can be dangerous with children about. Wait until they have grown up and turn the sandpit into a pool. Swings and slides take up a lot of space but if there is an old tree you could make a rope swing on one of the branches, making sure that it is quite strong enough first. An informal garden is best suited to children, then it does not matter if toys are scattered about the place and they will not feel restricted as they would do in a formal garden. Also, it is no good having winding paths if you have children—they will just take the shortest route across the garden. The best way to encourage them to respect plants is to give them a small plot of their own in which to grow things. 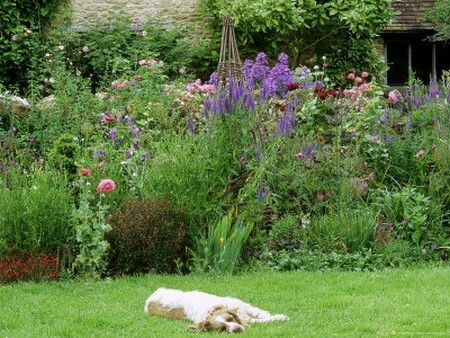 If you have a dog, raised beds would be sensible, so long as there is plenty of paved area for it to run around in. Cats cannot be so easily restricted but you could try planting their favourite nepeta (catmint) in one corner of the garden, to encourage them to keep off the other plants.